It's August! What's the weather like in Phuket? If you are a follower of this weather blog or just looking in for the latest Phuket weather information ... sorry there has been on update for 1 month (last update July 12th). This is because I spent 3 weeks in England, got back 5 days ago and only just feel human again. A very odd 3 weeks, since I had not been in England since 1999 and was there not for holiday, but to stay with my Mum who has cancer (again, this is her 4th time) and to spend time with my Dad who has had a rapid onset of dementia and is now in a care home. So, not a holiday. The weather in Southeast England during my 3 week stay was actually very good, most days sunny with temperatures in the 20's Celsius. Anything less than 20 and I felt cold. I vaguely kept up with the Phuket weather reports while I was away, but it was not important. 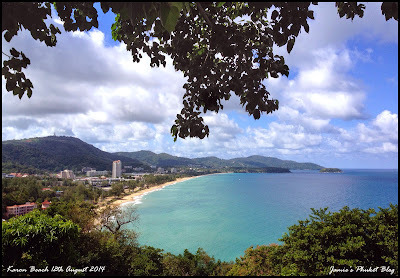 It's low season in Phuket, the weather is changeable. You get sun, you get rain, you get cloudy days, you get lovely days. Sometimes the wind blows and there are big waves, sometimes the sea is calm. Low season in Phuket you have to take with a pinch of salt and accept what you are given. But at least the hotels are cheap! For photos and regular Phuket news and weather updates, please do follow me on Twitter and Instagram! On August 7th I did not wake up until 10:30am. And it was a nice day! In the late afternoon we headed to Sapan Hin park in the south of Phuket Town for our kids to do Thai boxing class and for us to take a walk. Sapan Hin is a popular spot for people to come and exercise or just sit and have a snack (there are plenty of food stalls around). Weather was good. We did get a brief thunderstorm later, a quite normal end to a hot day! "Hot, sunny morning in Phuket ... clouds building now and not much wind, so could be some thunder this afternoon." "I was right. 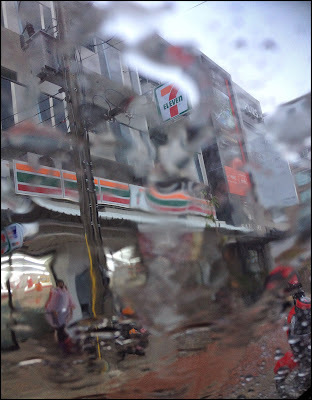 Heavy shower as I left the house to buy milk at 7 eleven. Just washed the car this morning too dammit!" Heavy rain for an hour, lots of water on the roads (some might say "floods") but the rain stopped and the sun came out and the water drained away. Not untypical tropical weather. 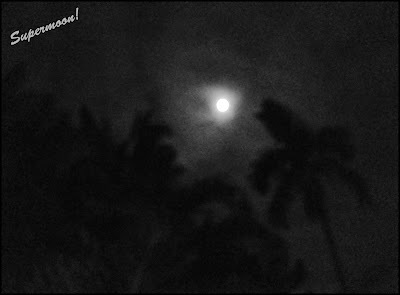 Oh yeh, and we had a "supermoon" though it looked to me like a normal moon. 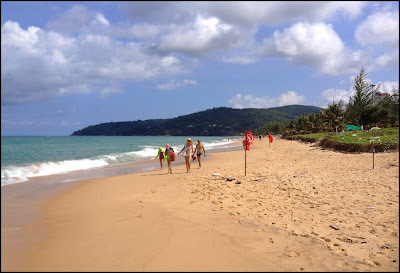 (above) Karon beach, 11th August. Big waves gone, lovely day to be on holiday in Phuket! And this morning I stopped on the hill between Patong and Karon where you find the old Karon Hill hotel and Centara Villas. Nice view from up there! I hope to update a bit more regularly for the rest of the low season. If you are in Phuket during the next couple of months - enjoy what sunshine you get and don't worry too much about rain. Carpe Diem.